Published Dec. 3, 2018 at 9:01 a.m. Whenever there was a question about Milwaukee's counterculture of the 1960s and '70s, or about the East Side during those years, I had a go-to guy. Any question I might have about, say, the Avant Garde Coffee House or the concerts at the Alternate Site, or who the drummer was in Ox, or where one might find Dennis Kitchen these days, what the scene was like at Springsteen's famous bomb scare show, or ... well, just about whatever, Mark Goff had an answer, a phone number and a slew of amazing photographs of it. Goff, who was there to document in words and on film that important era of Milwaukee history, is no longer here ... hard as that is to believe. After battling cancer for a number of years, Goff passed away at his East Side home on Friday at the age of 71. As his daughter Leah pointed out, Mark died of pancreatic cancer on the last day of pancreatic cancer month. "His first diagnosis with pancreatic cancer was 5 years ago," his daughter Alli said. "He beat the odds and held on, using that time to continue doing the work he loved, traveling the U.S. on his Harley, and spending as much time as he could with his grandson, whom he loved dearly. The cancer came back with a vengeance a couple weeks ago, but he was a fighter and an amazing conversationalist 'til the very end." Goff, who for many years has worked traveling the globe as a political consultant (he was in Iraq last month), leaves behind a loving family and a long list of friends. Even when he was most ill he never stopped working, never stopped riding his Hog, never stopped talking, reminiscing, arguing ... never stopped being Mark, a passionate and opinionated and whip-smart guy. Mark Goff leaves us a treasure trove of photographs of Milwaukee, especially, but not only the East Side, during the second half of the 20th century: poets, hippies, musicians, protests, gatherings, celebrities, coffeehouses, Milwaukee's youth finding and using its voice. 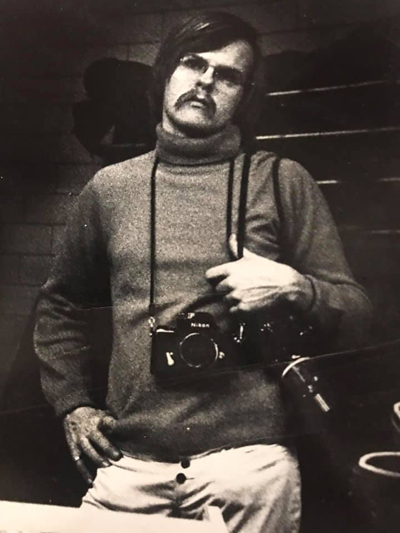 As friend Cindy Angelos noted on Facebook, "Mark's legacy of 1960s-70s Milwaukee counterculture photos are akin to the legacy of Milwaukee building photos taken by Lyle Oberwise in the 1940s-50s. They both left us with great gifts of Milwaukee's past." I'm proud to say that I also worked with him on a number of stories that he wrote for OnMilwaukee. Back in the day, you were likely – nay, guaranteed – to see Mark's images (not just the famous ones of George Carlin getting arrested at Summerfest) in alternative publications like the Bugle-American. Mark taught me a lot about Milwaukee history during that era and I had hoped he'd have time to share more. I'll miss his knowledge and our conversations, and, damn, I wish I'd asked him more, sooner. To his family, which he loved more than anything, I send my deepest condolences. Goff's daughters will host an event at Von Trier on Saturday, Dec. 15 from 2 until 6 p.m. Please stop by and help celebrate the amazing life of a singular guy. Comment from John Kois: Very sorry to hear that. He was always such a pleasure to run into, to talk to...and to just know he was out there. He will be missed by most everyone who knew him, and that was enough people to occupy a small country.